ya as simple to put together easy for the cats to use .I had to make my own center post to make room for our cats box .otherwise it it very weak without the divider in it but that is why it made that way .we just happen to use a big box so I’m. Not really complaining just mentioning Incase you use a big box as well it is better for small cat boxes otherwise heads up . But it’s nice looking fits in well and over all good but for the money they just should tell you more about it for the purpose of the size cat box you may use. As most cat owners know, you don't get to decide whether or not to have a litter box and that they're unattractive and hard to hide without making it inconvenient for your pet. Fortunately, with this clever end table, your litter box will be discrete while still maintaining easy access for your loved one. 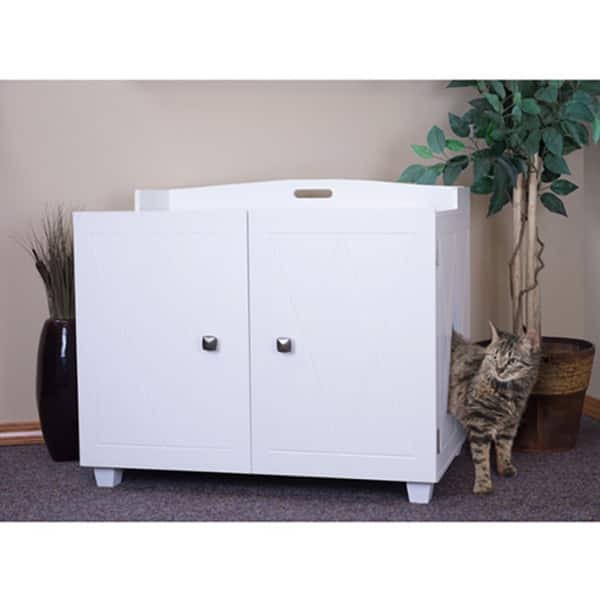 The FurHaven Designer Bench End Table Litter Box Cover is the perfect disguise for anyone looking to conceal their cat's litter box. Two solid doors hide the litter box while a hole in the side provides access for your pet to easily crawl in and do their business. Cover will fit litter pans up to 18.375" x 14.375" x 5.75". Your litter box will be easy to clean and even easier to look at! White finish with designer accents provide a stylish solution for your home. Who knew a litter box could look so good? Dimensions 20.0 In. X 30.9 In. X 26.0 In. In theory, I love this thing so much, our apartment is tiny and like half of it was taken over with gross litterboxes and this looks so much better. (Also it was easy and fun to build). 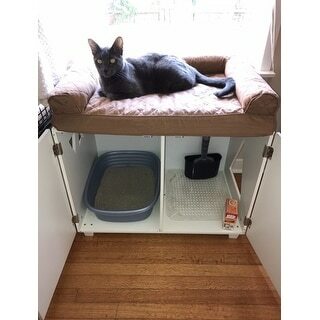 It would get 5 stars but there are a few issues: 1. the magnets aren't strong enough in the doors, the cats can easily push them open from the inside. But maybe our cats are weirdly strong? 2. I haven't yet found a litterbox that fits well inside it, they are all either tiny or too big! But this might be a critique of litterboxes themselves. 3. My cat immediately learned that she could jump on this and then on top of the bookshelf and stare creepily down at us while we eat meals. This, also, is likely not the bench's fault. First I want to THANK OVERSTOCK.COM customer service I made a boo boo on my order and they went above and beyond to get this product to me. so Thank You .. For this FurHaven White Bench Hidden Kitty Litter Box Enclosure I am thrilled with it. My friend and I 2 girls put it together in about 30 ish minutes and it was our first time putting a cabinet together and so I think that was quick. I am sure someone could do it quicker very good instructions only philip head screw drivers needed. The product is very sturdy and its heavy which is great. It does have a strong odor to it but goes away n a couple of days. I have 5 cats and 2 dogs.. 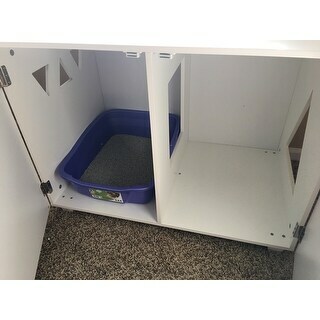 It can only fit a medium cat box in both sides or one cat box and you could put cat litter in the other side depending on how many cats you have. 4 of my Cats go inside no problem 1 cat doesn't but that's ok they have cat boxes elsewhere. This one is in the main living room and it is soooo nice not to see a cat box and smell it either. Bonus the dogs can't get to the cat box either, I highly recommend this product. I really like this litter box bench. We recently downsized and we have to utilize every inch of this place very wisely. 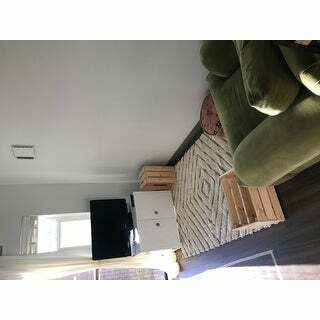 This looks like a piece of furniture and I love that I don't have to see the litter box anymore. My cat is a little messy so I do have to vacuum the inside frequently. I lined it with shelf paper so it is easy to wipe out. The bench is pretty, but the overall size for a cat box is too small. I thought the top would lift to make cleaning easier, rather then having to take the box out every time. The litter box area should be bigger to accommodate large cats. when they do #1, it sometimes and it leaks onto the floor, which is messy and will ruin the finish of the floor. Our guest room has been used for our cat since we moved in - no guests want to stay in a room with a litter box. 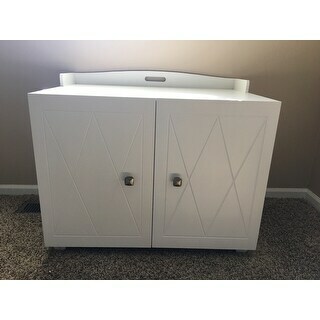 This cabinet is exactly what I was looking for to hide her litter box, and keep my dog away from it! 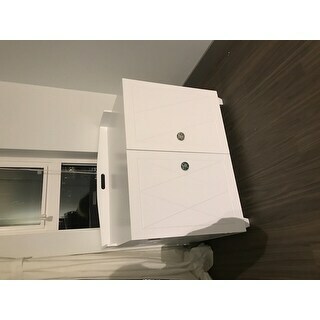 I had considered DIYing it with a normal cabinet, but nothing could even come close to how stylish this is at this price. Absolutely perfect. My only complaint is the same as another review, the magnets are super weak and she can easily knock the doors open, which defeats the purpose of keeping it from the dog. I'll have to come up to a solution for that but otherwise this is exactly what I hoped it would be!! I worked in the furniture industry in NC for years. Consequently, I am usually very disappointed in flat pack Ikea type products. This is the exception! First, when you get the package, it is HEAVY. Meaning the item may be particle board, but it is dense, high quality, well finished product. All the pre-drilled holes were perfectly aligned. The hardware is good quality. The back is just cardboard, basically; the only substandard aspect of the piece. I love the doors, which fit well, and especially the cat access holes and ventilation. Great idea, contains stray litter and best of all...you don't have to see the box contents! Love it! This is perfect for that small space that you still need to camoflauge.... like the guest bathroom/laundry room! Its perfect for my cats and so easy to access the box for cleaning... i love it.. Ive had wood ones and you still get a bit of pee from the cats onto the wood which ends up rotting and having to throw it away... not this one... wipes right up! This is so cute and it is exactly what I wanted.... but I strongly recommend not buying it. It is not worth the nightmare of cleaning it! Every single litter box clean is a gross mess. And it smells ALWAYS of straight urine.. not even litter soaked urine.. straight urine. I have to carefully remove the litter box to clean it, I say carefully b/c pee will pour out of the bottom while I slide it out. Then wipe down the whole interior of the cabinet. Then clean the litterbox of course, then place it back. And it all still smells like I still have a dirty litter box. I started using puppy pads under the litter box and that helps but the smell is still terrible. And do not use litter box liners! They add to the moisture problem. So disappointed :'( I still rated 2 stars instead of 1, just in case it's me and I'm an idiot and can't figure this thing out. This is a great kitty litter hidden box. it does not look like a kitty litter box just a piece of furniture. It has a great price and quality. Very fast shipping . My cat loves it! 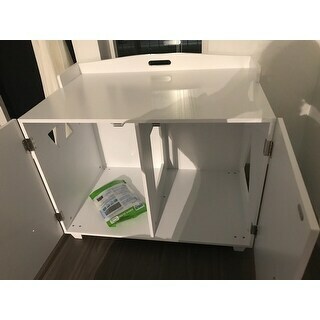 Also a space to hide your cat food and water. Easy to assemble. Clean-looking. Comfortable, versatile space on top for lounging AND for other practicle uses. 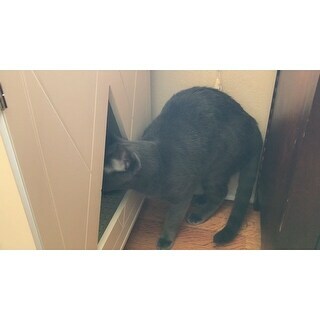 Cabinet space underneath is big enough for my 18lb cat Charlie. *Charlie is not in this pic. Grayson is more photogenic The only issue I had was that the litter pan is not big enough for a large pan, however, having a smaller pan ensures I check it more regularly which is good for them, too. I thought maybe the other reviewers had been heavy handed or done something wrong, but alas the doors DO NOT line up. Every hole is predrilled and the entire cabinet is particle board except the two piece back panel (which feels like cardboard) and freely shifts out of square every time you touch or put anything on the cabinet. My larger cat was in it once and his 13lbs actually made it shift hard enough to pop the magnetically closed door open. The fact that they call this item a bench is just laughable. I wouldn't sit on or place anything valuable on top of this shelf. Yeah, it's a place for my cats to take a dump, but I spent over *** and 45 minutes screwing it together only to realize it's about 4 steps below Ikea discount grade. I would not recommend this item for anyone that isn't planning on hiding this piece of garbage in a garage or basement closet. I wants too sure how to feel about buying an IKEA like product, I wanted to make sure I would be able to handle moving, cleaning, and the ins and outs of my cat. This was much better than expected. It goes together with extreme ease. Simple instructions. And beautiful afterwards. The bench went together ok. But I can't recommend this item. My cats always seem to pee over the side of the litterbox, so pee leaks out onto the floor. Not sure if this is just my cats, but this is way more messy and inconvenient. Also the back is cardboard...so if your cat pees high towards the back it's probably not gonna be clean. Omg I love it! My cats transitioned to it right away. This litter box enclosure is just ok. The instructions were easy enough to follow and could be done by one person. Once assembled the doors didn't exactly line up perfectly. Maybe I'm OCD but it bothers me every time I look at it. Also check the measurements because it does not allow for a very large cat box. Easy to put together! Very sturdy. Holds two litter boxes! Easy to assemble, I was able to do it on my own and I have 0 experience in building furniture. The back pieces are a little thin, but lining the inside with inexpensive contact paper is a great way to avoid “spills” ruining the furniture. Makes a great tv stand! I added my own knobs but the ones provided are sturdy and cute. The very best thing I ever done. You should buy for your cat or small dog it keeps everything in the bench and the house floor clean. 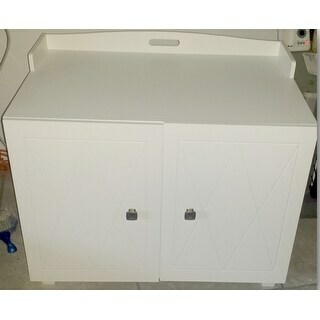 This is very nice looking in my living room, no one even suspects it’s for storing my cats litter pan! I love it! Not for the intended purpose. "Is there a hole built on the inside divider? Or is it a slant divider they step over? I can tell how the cats get to the litter box?" "I need the opening on the left side, can I switch it?" If you are handy, yes. You would need to make the appropriate holes for the hardware and all that. "What are the interior dimensions of this piece? I read one answer which said the interior height was approximately 5 inches. That cab't be correct ." 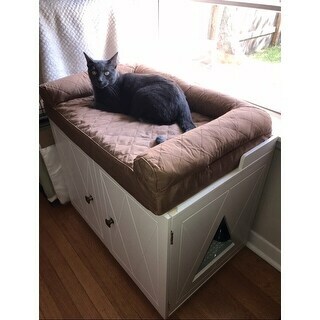 The interior measures approximately 30 inches W x 21.5 inches H x 19 inches D.
"Can you slide the center inside divider closer to the outside triangular opening, so to allow for a larger litter box? Thank you." No, all of the components must be assembled as directed. 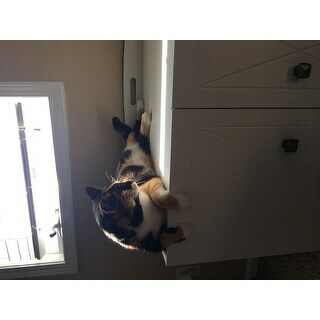 The litter box I use is actually a drawer from a cheap, plastic, 3-drawer unit made by Sterilite (I think). It measures @ 15" x 10.5" x 7", the extra height is a plus. My litter genie fits in the right side. A water fountain and food are set on top, much better than on the floor, in my opinion. I'm very happy with this unit. "What litter pan do you use for this? Links would be great. Thank you." I use a standard medium-sized litter box. The dimensions are 16x12x4. A regular sized pan works; The most basic/cheaper ones sold in stores. Something bigger or with higher sides will be too big. New puppy loves to play in box and this is much nicer than the corrugated box we are currently using. Needed for hiding boxes from visitors and manage smell better! Purchased in an attempt to keep our dog away from the litter box. "Can you leave the divider out?" I try doing that and it lost some of the support so it wiggles a little bit.